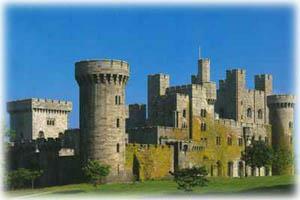 Penrhyn Castle Castle19th-century fantasy castle with spectacular surroundings. This enormous 19th-century neo-Norman castle sits between Snowdonia and the Menai Strait. It's crammed with fascinating items, such as a one-ton slate bed made for Queen Victoria, elaborate carvings, plasterwork and mock-Norman furniture. It also has an outstanding collection of paintings. The restored kitchens are a delight and the stable block houses a fascinating industrial railway museum and a model railway museum. A massive neo-norman fantasy castle crammed with fascinating things including carvings, handmade wallpaper and paintings. With shop, tea rooms and events.